Washington Park Elementary is just beging to be demolished. 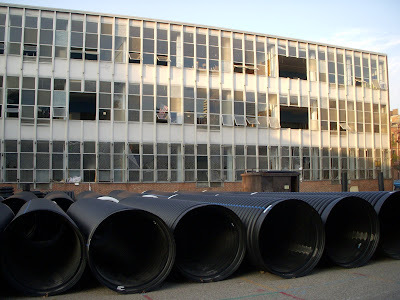 The black corrugated plastic pipe is for storm water detention under the parking lots for SCPA. They are putting the pipes in the ground at the corner of 12th adn Race, which tells me this is where the parking lot is going to be. It was an bad decision to put the parking facing the park in my opinion. Homeless Shelters Banned from Covington?